Short-term interval-force (I-F) relations describe the dependence of cardiac muscle contraction strength for short interbeat intervals. Two phenomena that characterise these short-term I-F relations are restitution and postextrasystolic potentiation. In their 2000 paper, J. Jeremy Rice, M. Saleet Jafri and Raimond L. Winslow use two modelling approaches to study short-term interval-force relations in cardiac muscle. Their first approach employs a relatively simple (or minimal), discrete-time model of excitation-contraction coupling. 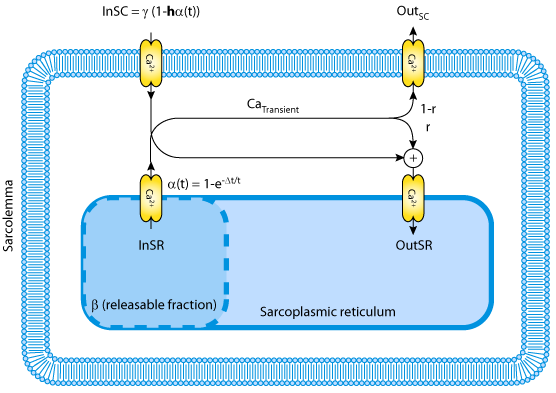 This model explains restitution and postextrasystolic potentiation in terms of the total amount of Ca2+ stored in the sarcoplasmic reticulum (SR) and a feature in which Ca2+ stored in the SR slowly becomes available for release into the sarcoplasm (see below). In their second modelling approach, J. Jeremy Rice, M. Saleet Jafri and Raimond L. Winslow develop a more detailed ventricular cell model that is able to simulate action potentials, Ca2+-handling mechanisms, and isometric force generation by the myofilaments. This single comprehensive (or maximal) model combines two previously developed models (see The Jafri-Rice-Winslow Ventricular Model, 1998 and Cooperative Mechanisms in Cardiac Muscle, Rice et al., 1999). The first ventricular cell model describes membrane currents and Ca2+-handling, and the second model of myofilaments provides the force generation of muscle contraction (see below). The ventricular cell model provides the Ca2+ needed to drive the myofilament contraction. This is a feedforward pathway in which Ca2+ binds to troponin and initiates force generation by triggering myofilament contraction. A feedback pathway also links the two models, as the affinity of troponin for Ca2+ is a function of developed force. 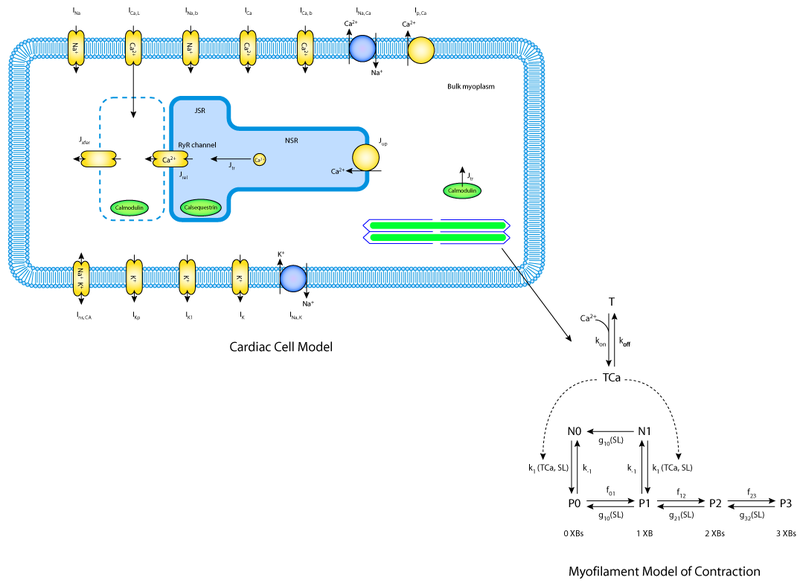 Schematic diagram of a detailed, single ventricular cell model which is able to simulate action potentials, Ca2+-handling and isometric force generation by myofilaments. Simulation results generated from the model support experimental data. They suggest that short-term interval-force relations result mainly from the interplay between ryanodine receptor adaptation and SR Ca2+ loading with additional contributions from membrane currents and myofilament activation. Derived from workspace Rice, Jafri, Winslow, 2000 at changeset 4533913da7a3.